Posted June 13, 2015, 6:32 p.m.
Posted June 12, 2015, 3:26 p.m.
Posted June 10, 2015, 7:39 p.m.
Posted June 10, 2015, 11:23 a.m. Authorities are hoping a $20,000 reward and a flood of fliers will help find the gunman who robbed and killed San Dimas businessman Pravin “Peter” Patel outside his Quiznos restaurant this month. Patel’s family stood quietly beside the investigators as they announced the reward for information leading to an arrest and conviction of the suspect. Behind them, flowers and cards were piled up beside the restaurant that Patel and his wife, Maya, had run for nearly 11 years in the Fitness Plaza, a popular shopping center on the west side of San Dimas. Killings are rare in this bedroom community of about 33,000, with six people killed since 2000. The business has been closed since June 2, when the robbery occurred about 3 p.m. Patel was working alone in the restaurant with two customers when the robber came in, showed a handgun and demanded money. The robber threatened harm to the customers if Patel did not comply, said Lt. David Coleman of the Sheriff’s Department Homicide Bureau. Patel gave him the contents of his cash register, then followed the man outside. There, a few feet from the entrance, the men scuffled and the robber shot Patel once in the abdomen before running away. Deputies passed out fliers featuring a composite sketch of the suspect, described as a tall, skinny white man or Latino in his early 20s. The suspect was wearing a baseball hat, black T-shirt and plaid shorts, and reportedly ran behind the building after the shooting. Coleman said investigators don’t know if he got into a car afterwards, or just ran away. A tall, concrete-block wall separates the businesses from a neighborhood of well-kept homes behind it. Family members, including Patel’s adult son and daughter, declined to talk to members of the media at the news conference, but customers, business associates and friends described the victim as compassionate and caring. Theobald came to the scene to pay her respects. Others were afraid to give their names as long as the shooter remains at large. Two longtime customers have organized a candlelight vigil for Patel in front of the restaurant at 7 p.m. June 12. Other businesses adjoining the restaurant displayed posters about the vigil and the reward, as well as a fund set up to help the family. People who work and shop in the area were shocked and saddened by the killing. People described Patel as a down-to-earth, hardworking business owner who made a point of getting to know his customers. A business owner nearby, who declined to be identified out of fear for her safety, heard the shot that killed Patel and ran outside to try to help. A week later, the woman was still trying to process what happened. At the news conference, reporters and bystanders wondered why Patel ran after the robber after he left the store. Coleman, the lieutenant, said investigators don’t know the reason, but they speculated that Patel may have hoped to see where the robber was headed. The business owner said she was surprised that Patel chased after the robber. Though he never met Patel, Nate Younan, who owns San Dimas Liquor nearby, said he could understand why, in the heat of the moment, Patel ran after the robber. Younan said he has chased after people running out of his store with a case of beer. He knows that’s not recommended. Younan is collecting money for the family in a fireman’s boot positioned by the cash register of his store. On Wednesday afternoon, it was half full of fives and ones. Younan hopes to match whatever his customers contribute. "The moral of the story is that we need to stick together as a community, whether we know each other or not,” he said. “We have to be there for each other. Giving is healing." 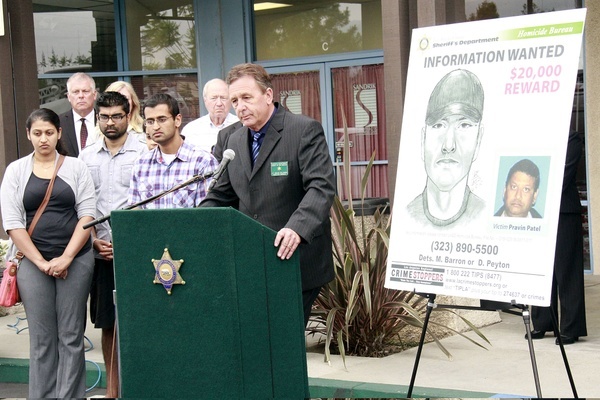 Anyone with information is asked to call the Sheriff's Department Homicide Bureau at (323) 890-5500. Anonymous tips can be made via Crime Stoppers: (800) 222-8477. FOR THE RECORD: A previous version of this article identified Maya Patel as Mary. This article has also been changed to reflect the number of years the Patels owned their Quiznos restaurant franchise. The Patels opened their franchise on Dec. 31, 2004, according to Elizabeth Sapp, Quiznos senior vice president of communications.